That’s what my new coworkers tell me. Sometimes we get a catered lunch or pizza as a reward at work. Also, some of my coworkers have taken to cooking for each other. “Good” Linda is famous for her waffles. She actually makes them at work and everyone lines up because they love them. I think she has her waffle event in April, so I am crossing my fingers! This past week one of my coworkers kept asking for meatloaf. He wasn’t asking me, I guess because I am the new girl. He kept asking “Bad” Linda. Apparently there is a meatloaf history that I don’t fully know about. Every time he asked for meatloaf, I kept thinking, “I have ground beef. Ferdinand (my husband) doesn’t really eat ground beef.” Hmmm. 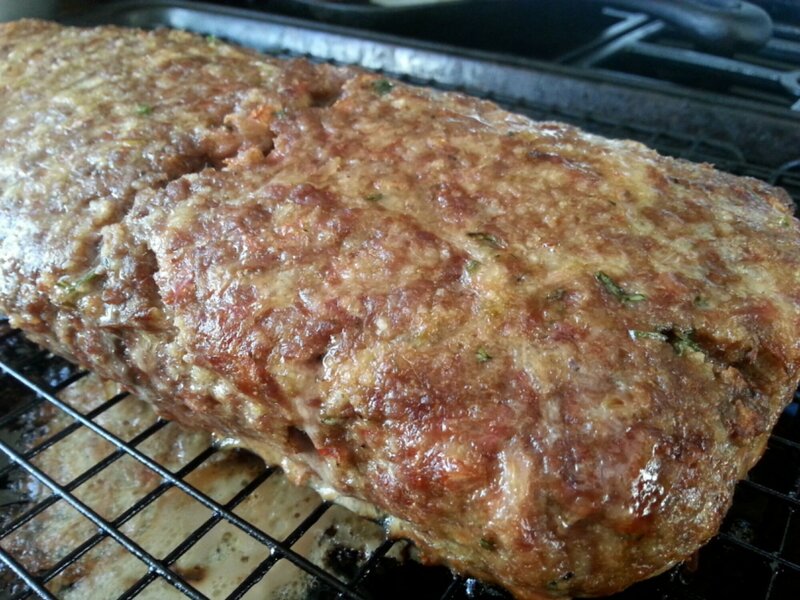 I was perusing Pinterest, as usual, and happened upon a delightful looking meatloaf, and, yeah, I pinned that! Do you see where this is heading? The meatloaf I based this recipe on was based on one by Ina Garten, but I found it here from The Food Charlatan. 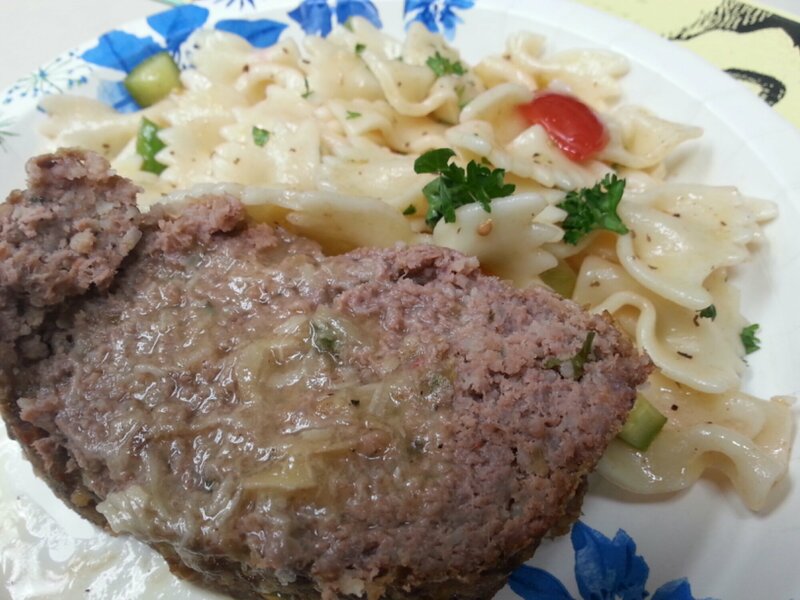 At my work, it may be all about the food, but when you’re talking meatloaf, it’s all about the garlic sauce! To make the garlic sauce: Bring the garlic in the oil to a boil, then lower the heat. Continue to cook until the garlic just turns golden, about 35 to 40 minutes (it will be soft throughout). This can be done the night before. Remove the garlic and reserve the oil for another use (it is delicious and adds a subtle garlic flavor to whatever you cook with it; store in the refrigerator). Add the garlic to the chicken stock (or broth), and butter. Cook at a boil until the liquid reduces and thickens a bit, about 35 to 40 minutes. Mash the garlic with a fork and season with salt and pepper. This can be done while the meatloaf is cooking. To prepare the meatloaf: Preheat your oven to 350 degrees F.
Saute onions and celery in a large skillet, in the olive oil, until the onions begin to soften, about 5 to 8 minutes. Stir in the sofrito, if using (if frozen just drop in about 3 ice cubes worth and cook until thawed, then stir to combine). In a large bowl, combine the eggs, parsley, thyme, milk, and bulgur (or breadcrumbs). Season with salt and pepper. Mix in the ground beef and onion/celery mixture. It is okay to use your hands for this, just don’t go crazy; you just want everything kind of evenly distributed, but you don’t want to kill it. Pinch off a small bit and cook, over medium heat, in the skillet to check for seasoning (salt and pepper). Add more if needed. Form your loaf on some parchment paper or waxed paper, then transfer to a rack placed over a rimmed baking sheet (this allows any rendered fat to drip off). Bake to an internal temperature of 155 to 160 degrees F. It takes about 45 minutes. Once the meatloaf is done, slice it and serve with the garlic sauce. Thanks for the shout out! Yes, it IS all about the garlic sauce 🙂 Also, I reallllly want to try meatloaf with sofrito in it now! Yum!! I spent a peaceful Saturday pottering in the kitchen, I thoroughly enjoyed myself putting together this very good meatloaf and I’m only sorry that I didnt allow for the sofrito and didnt have all the ingredients when it came to it (red peppers are amazingly scarce here right now, and I hadnt looked around in advance) . So I left the sofrito out but this is on my Have To Make list!!!!! I used the options of whole milk, and breadcrumbs, and I packed the meatloaf into a loaf pan to bake, hope that was ok, and it did indeed bake very well like that. The garlic sauce, yum yum yum!!!!!!!!!!!!! I went out and bought a whole pile more garlic so I can make Lots!!! this made a great dinner, served with baked butternut and broccoli-cauliflower mash, and of course, it made plenty of meatloaf is my husband will be having a blissful week of lunches 🙂 Thank you, Lucy, lovely recipe, much enjoyed.